Notes: "Village of Hanover Park"
Description: Shot from Milwaukee Avenue Bridge. Description: Milwaukee Road F40C 45 at Western Avenue in Chicago, Illinois on January 24, 1983, Kodachrome by Chuck Zeiler. 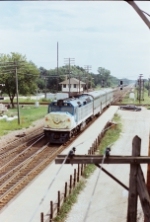 Built in April 1974 ( c/n 73612-8 ) and named "Village of Hanover Park", this locomotive became METX 605, was retired in 2004 and sold to Helm Leasing and presumed to be scrapped. 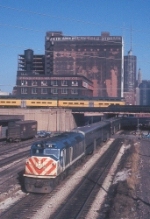 Description: Milwaukee Road F40C 45 at backing into Union Station at Clinton Street in Chicago, Illinois on May 12, 1983, Kodachrome by Chuck Zeiler.